LONDON - Coca-Cola Great Britain is extending its 'Schwim Free' campaign under the Schweppes Abbey Well brand, allowing consumers to swim for free on any weekday. The brand is supporting the offer through in-pack, digital and outdoor activity, which kicks off today (Monday 15 March). When the campaign was launched in 2009, consumers could redeem a free swim, using Abbey Well bottle caps, on Mondays only. Consumers can now redeem a free swim on any weekday, and the number of participating pools has been increased from 350 to more than 500. The ‘Schwim Free' microsite, www.SchwimFree.co.uk, allows swimmers to search for their nearest participating pool, via a Google Maps application. One aim of the activity, apart from driving sales, is to get more people active as part of the London 2012 Olympic Games legacy. Coca-Cola said that more than 45,000 free swims were redeemed from the Abbey Well promotion in 2009, and predicted the figure would grow in 2010. The soft drinks giant acquired the Abbey Well brand in November 2008. Cathryn Sleight, marketing director at CCGB, said: "Schweppes Abbey Well is committed to promoting an active lifestyle. 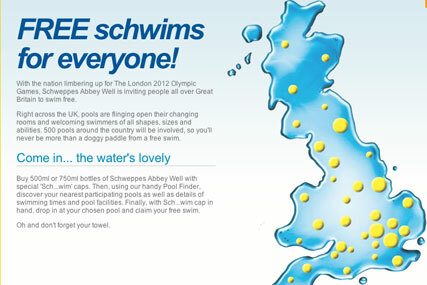 "Having set the foundations last year, we're proud to be extending the campaign for 2010 making a ‘Free Schwim' more accessible to everyone across Great Britain, while continuing to engage consumers with humorous advertising that brings the brand personality to life."